Renovated in 2002, the Club House exterior is adorned with Miyazaki's famous Obi Japanese cedar, giving it a quiet, calming, traditional Japanese appearance. However, when you step inside, you enter a world of indirect lighting and an overall brown color scheme, a decor with a distinctly international flavor. 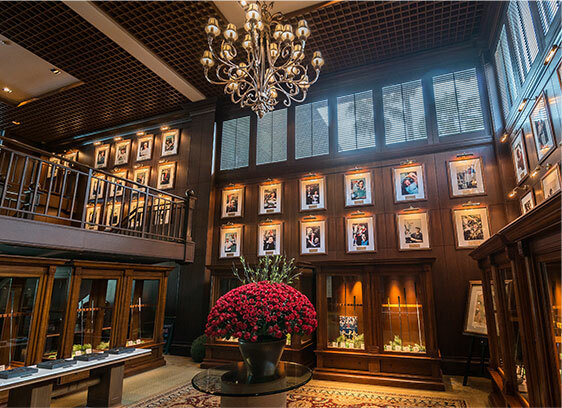 Upon entering , the first thing you see are the tournament memorial items, like photos of past champions on the wall, caddie bags signed by Tiger Woods and Sergio Garcia, and other pieces take you back through the history of the tournament. Also, you can enjoy the seasonal delicacies of Miyazaki at one of our fine restaurants. Only for those about to play at Phoenix Golf Academy. JPY 400 for 36balls. Please use soft spike shoes. Customers wishing to make reservations 3 days or less in advance of the desired date of play should reserve by phone. An e-mail message confirming your reservation will be sent the day after the reservation request. This message will contain your reservation number. Please understand that your reservation is not official until this point. You might receive a phone call to reconfirm your reservation. Fees apply for cancellations made 5 or fewer days prior to the reserved date of play. Cancellations made the day prior to the date of play incur a fee equal to 50% of the total bill, and cancellations made on the date of play equire full payment. Surrounded by black pine groves, the beautiful 18-hole course fairway is narrow, with subtly-placed bunkers, requiring a very accurate iron shot. Golf carts are allowed on the fairway, allowing you to enjoy a sporty, casual game with cool breezes and shade. Our course offers the convenience of 18-hole play. For getting to the Club House, please take advantage of the convenient and free Garden Shuttle Bus, which takes only 5 minutes from the Sheraton Grande Ocean Resort. Only for those about to play at Phoenix Golf Academy. JCB, VISA, UC, MC, AMEX, etc. 18 holes play on a personal self-driven golf cart. Taking a holistic and proactive approach to golf instruction the instructors will guide you through a golf program where you are the center of the process. PGA instructors are trained to quickly and accurately evaluate every student in terms of fitness, flexibility, current skill level, technique and mental skills, and then in consultation with the student devise a program to meet their needs. We constantly encourage students to ask as many questions as they like. Understanding your personal swing predispositions and the means to make the necessary changes to achieve your desired results are the key to every PGA Golf School. Our instruction is always student focused where the swing changes are based on your personal capabilities, skill levels and commitment. Not everyone can swing the club like David Duval or Tiger Woods, and at our Golf Schools you will never be asked to swing in a way you body is not capable. The instructional philosophy at the Phoenix Golf Academy is "enthusiastic instruction and certain progress.